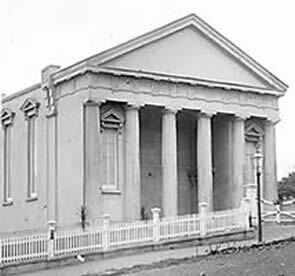 The original building was designed in the 1870’s for the Beresford street Congregationalist Independents by Philip Herepath, an Auckland architect who also designed the nearby Gothic style Pitt Street Methodist Church. The Beresford Street Independents initially wanted a masonry building but cost restraints allowed the proposal of a radical new building material to be considered. This material was poured concrete. The selection of material of poured concrete was ambitious and new for its time but after 15 months of construction, it was successfully completed. A number of experimental cast concrete structures were built during the same time, they were constructed solid concrete with no metal reinforcing (a development of the 1890s). However, most of the very early buildings have not survived more due to later redevelopment than any structural shortcomings. The new concrete church for The Beresford Street Independents remains one of the earliest surviving poured concrete buildings in New Zealand. The opening of the new church was reported nationwide and attended by 300 people. The first ceremony was held by Sir George Grey, who was to become the Prime Minister the following year, and pastor, the Rev J W Davies. The church was instantly recognised as one of the most handsome of its kind and noted for its excellent acoustics.